Forward Control Jeeps can trace their heritage back to 1957 and the early CJ-5 Jeeps. The new design was based on the existing CJ-5 frame in an attempt to make a vehicle with the off road ability of the universal bodied jeeps but with increased cargo capacity. These Jeeps were produced for the civilian and industrial markets. In 1962 four prototype FC Jeeps were built and tested for use by the military. These four Jeeps were Designated XM-676, XM-677, XM-678, and XM-679. I know of two images of these prototypes. They show the XM-676 and XM-678 during a winter "Test Operation". No differences seem to be visible between the two prototype images and the production M-676s and M-678s which were produced under Navy / USMC contract in 1964. Military FCs came in four variations: the M-676, M-677, M-678, and M-679. The M-676 is simplest of the models, essentially a repowered civilian FC with some other minor modifications. The M-677 is a four door crew cab with an abbreviated bed. Both the M-676 and M-677 were available with aluminum canopies and/or folding wooden bench seats. The M-678 is a carry-all or van body with 3 cabin doors, 2 rear doors and removable seating for seven: 2 front, 2 mid, 3 rear. The M-679 is an ambulance body, essentially the same as the M-678 except there are only 2 forward doors and no windows. Wheelbase 103 5/8" 103 5/8"
Tread Front 63 - 7/16" 63 - 7/16"
Tread Rear 63 - 13/16" 63 - 13/16"
Height 79 - 7/16" M-676: 91"
G.V.W. 7000 lbs. 7000 lbs. Curb Weight 3490 lbs. M-676: 4240 lbs. The M-67X series trucks are very similar in construction to those produced for private consumption. The primary difference between the two is the powerplant. Civilian FC-170s are powered by the Continental 226 cid "Super Hurricane" 6 cylinder gas motor. Military versions are powered by a three cylinder, two cycle loop-scavenged Cerlist Diesel displacing 170ci. Additional information on the Cerlist Diesel can be found on my Cerlist Diesel Page. The physical dimensions of the civilian and military versions are identical except for height. Military FCs are taller than their civilian counterparts in part because of the canopies on the pickups and the vent and emergency light on the ambulance. The Cerlist is at a power disadvantage to the Continental engine, but the military doesn't place speed as the top priority in engine selection. Among the more important considerations are longevity and reliability. Diesels in general have a longer service life than do their gas powered counterparts, and the Cerlist, being a two cycle design, has the advantage of no intake valves, no exhaust valves, no camshaft, no pushrods, no timing chain, and none of their associated adjustments. The rest of the drivetrain on M-67X trucks is the same as on civilian FC-170s. Power is routed through a Warner T-90a three speed to a Spicer model 18 transfer case into a Spicer model 44 front and 53 rear axle. Axle ratios were 4.89 to 1 and 4.88 to 1 respectively. All the components of the driveline are standard Jeep parts and very easy to come by except for the Spicer 53 rear axle and perhaps the transmission input shaft as this may be a part unique to military FCs. Top speed of these trucks is reported to be in the neighborhood of 45-50 mph. The Cerlist is not entirely to blame despite its 85 hp rating, remember that the factory tires measure only 30 inches in diameter and the gear ratio in the axles is 4.88:1 and that stock FCs with the gas engines didn't go any faster. Positive visual identification of a FC as a military version is quite simple even for the M-676 which was the least modified. The dead giveaway from the outside is the missing tooth in the grille. Civilian FCs have a seven slot grill with all the slots the same width. Military FCs will have six slotted grills with 5 of standard width, and one that is more than twice as wide to allow for the installation of blackout lighting. The dashboard of the FC is also an easy way to determine if it is of military origin. A civilian FC is equipped only with the standard 3 gauge cluster that has seen service in most of the universal bodied Jeeps. Military dashes have a dedicated speedometer, ammeter, oil pressure gauge, temperature gauge, and fuel gauge. In addition, there is a 3 lever control for all the lighting functions of the truck. All known military FCs have a distinctive front and rear bumper not found on any civilian model. This bumper is constructed of two identical pieces of C-channel welded to form rectangular stock with U-shaped loops presumably for for loading the vehicles aboard ship. The Military front bumper is capable of supporting the weight of the vehicle on a jack, whereas the civilian versions are not. M-67X series vehicles all carry a military tag like this one. The plate lists what was some of the most important data relevant to identification and operation of the vehicle. I have copied the data as it appears on my truck in the table immediately beneath the photo. I am making attempts thru various government agencies and private parties to acquire additional information on my M-678 and the other M-67X trucks using this data. Please e-mail me if you have any good leads on sources of information. The Federal Stock Number is comparable to the UPC code on a consumer good. It is unique to the item and was likely used in inventory control, but is not useful in determining vehicle history. If all of the FC Jeeps were purchased at under one contract, then the contract number should be the same for all military FCs. So far, I have only seen military FCs produced under contract number: DA20-113-ORD-29907. If you know of a mil FC with a different contract number than this let me know. Though unlikely, it may aid in finding additional information or determining the final vehicle count. KAISER Jeep CORP. MODEL NO. GROSS WEIGHT MAXIMUM 7000 LBS G.V.W. One of the primary goals of this page is to determine a production total for Military FCs that is as accurate as possible. Production of civilian FC-150s and FC-170s is well documented during the Willys Overland years, but records from the Kaiser years are essentially non-existent. When I purchased the M-678 the previous owner said that van production (both M-678 and M-679) was 60 total, but he did not know the breakdown between the two models. He also said that total military FC production is 400 units, but he did not know the production numbers of the M-676 or M-677 versions. He added that the first truck (unknown type) 9328?-10001* was the factory test mule, and that 9328-10002 and 9328-10003 were on Henry Kaiser's estate and given full interiors, and therefore my M-678 should be the lowest serial number FC actually delivered to the USMC. I have no proof of any of these statements, but so far they fit the known data. So my production figures will assume these statements to be correct until they are proven otherwise. 1: Most of the military FCs are M-677s. * No longer true as new serial numbers have surfaced. 3: All M-678s and M-679s known are between 1 and 60. Some of the basic assumptions here are that the Navy contract specified round numbers for convenience (20 of this, 100 of that), and the statements by the previous owner are correct (#1 was a test mule, and #2 and #3 went to Henry Kaiser). These assumptions were further supported by Fred William's M-677 #109 which has Cerlist engine number 43. Some serial number math: 109-43=66. 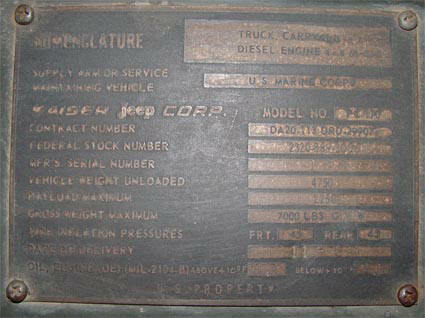 66 just happens to be the theorized first M-676 serial number (and therefore the first truck to receive a Cerlist motor). To me this indicated that my serial number theory was close if not exactly right on. To recap: M-678 and M-679 chassis production first and covering about 60 total units, followed by M-676 production (first to receive engines) of 40 units, followed by M-677 production. -- It just fit too nicely. However, since the appearance of M-679 #14 (which overlaps M-678 #20), and M-676 #123 which overlaps several M-677s. I have decided that the initial serial number pattern is coincidental. I'm now going to assume that Serial numbers started with 10001 for each of the four military types just as FC-150 and FC-170 serial numbers started at 10001 with the prefix identifying the model. The ultimate proof of this would be a pair of trucks whose complete serial number differed only by the prefix. If it is true that each model started out at # 10001, then determining total production is a bit trickier. Below is a table listing the serial numbers of the known survivors and production derived from the assumption that the survival rate for military FCs is 5% (5% is often stated as an average survival rate for fifties and sixties cars). My "Best guess" figures that there must be at least as many units as the highest surviving serial number and are rounded on the tens. Designation: Survivors: Known Survivors: Production at 5% Survival Rate: My Personal "Best Guess"
Known Survivors: Production at 5% Survival Rate: My Personal "Best Guess"
With the recent addition of several m-677s, the derived production number of 1000 units is higher than expected. Perhaps the survival rate for these trucks is higher than 5%. Since the serial numbers are still all under 400 even as new trucks surface, I'll continue to expect a total production somewhere between 600 and 700 figure. As always, without production documentation, that number is subject to change as new evidence is presented. FC production was never more than a few thousand units per year, and was winding down to zero in 1965. Production of civilian FC-170s in 1964 (the year in which the majority of military FCs were delivered) was reportedly 1119 units. This is according to some notes found by Jim Allen . Since yearly production was measured in terms of several thousand units, I assume that there was only one production line in operation for all FC production. A large spread in delivery dates for the military versions seems to support this assumption. In addition to the low production numbers, some very crudely made interior pieces also indicate that the vans were handmade. When you inspect the underside of the of a M-678 van, the body shows remnant sheet metal bracing found on the rear of a standard cab FC-170. From this, I believe the first 60 chassis were either only partially constructed FC-170 standard cab models (cowl and windshield only), or perhaps were completed cabs on frame that were later cut in half. Either way, These early chassis were partially completed and then most likely moved to a storage facility (parking lot) and then on to an open floor for construction of the custom van bodies as space and labor permitted. M-677s production (approx 400 units) may have been enough to merit inclusion as a regular production model on the line. Delivery dates obtained from the mil data plates indicate that the van bodies (all with low serial numbers) were delivered many months after many of the higher serial numbered M-677s and M-676s. My M-678 (#4) has a delivery date of 11-64. M-678 #20 has a delivery date of 10-64. The 677s have earlier dates of delivery (mostly 5-64 and 6-64) and all have higher serial numbers than the vans. The Cerlist engine serial numbers however are lowest in the vehicles with the earliest deliver dates. My Cerlist is #215. This is evidence that because of the hand finishing required, the van chassis did not receive their engines until after their bodies were finished. Again, this is a working model and subject to change as more information comes along. Please don't neglect to e-mail me with any insights or information you may have related to military production. Kaiser proposes the diesel powered FC to the D.O.D. Recently Dan Laity was on the forum and spoke of some material in his possession that regarded Kaiser Motors attempt at acquiring a military contract for the Forward Control vehicles that the company had been producing since 1957 based on the FC-170 truck. They had received information that Chrysler was losing their contract for the M37 that they had provided and there could be a gap before the new vehicle (The Gamma Goat, Mil. Contract - 1968) would be online. Kaiser officials felt that the FC-170 with a diesel motor could possibly fill the bill. With serious doubts of the Gamma goat final production status the decision was to provide a proposal brochure to the Department of Defense on the new diesel powered FC-170. Below is the brochure that Kaiser had in their possession and also a few other memos on the proposal and a draft of how it should look. It is unsure if the 1963 Comparison study was used verbatim or as a outline for the 1964 proposal but it is indeed some very interesting reading. The Comparison study... FC-170 vs. Ram-I is a hand written outline and a little tough to read but I would guess compares the FC to the proposed Gamma Goat. Note at the time the Gamma Goat was a gasoline (Corvair) powered vehicle. Many thanks to Dan Laity for providing this information. Dan Horenberger has compiled a list of maintenance parts that are needed in a stock M-677 and kindly sent the information to me. If any others have anything to add please email me and I'll get it up there. AIR FILTER NAPA number - 542009 and they aren't cheap. MISC HOSE There is also a small around 1" hose with a sharp bend. Never got a NAPA number just matched one up off the shelf that was way longer and cut it. BELTS Standard Bearing. Here are the part numbers. BLT400J7, and BLT490J7 they are 7 groove. they last new 24 volt headlights without from NAPA# # 4800 or GE bulb #4800 but are not always in stock. Recently Dan Horenberger contacted a gentleman from Poland who was advertising reproduction Data Plates for Jeep models including the Forward Control Jeep models. He had posted a M-677 data plate which had not been available in the past. Dan has in his possession all 4 different M-Series Data Plates and was kind enough to get detailed pictures with the exact specs for reproduction to this gentleman and is awaiting his response. Dan had commented, "Interesting how each one has a different nomenclature, fed stock number and weights. Plus sure is nice to have all 4 sitting here to take pictures of." Yeah, I bet it is! Apparently the gentleman from Poland is also able to reproduce the stock civilian ID plates and they should be in the works soon. 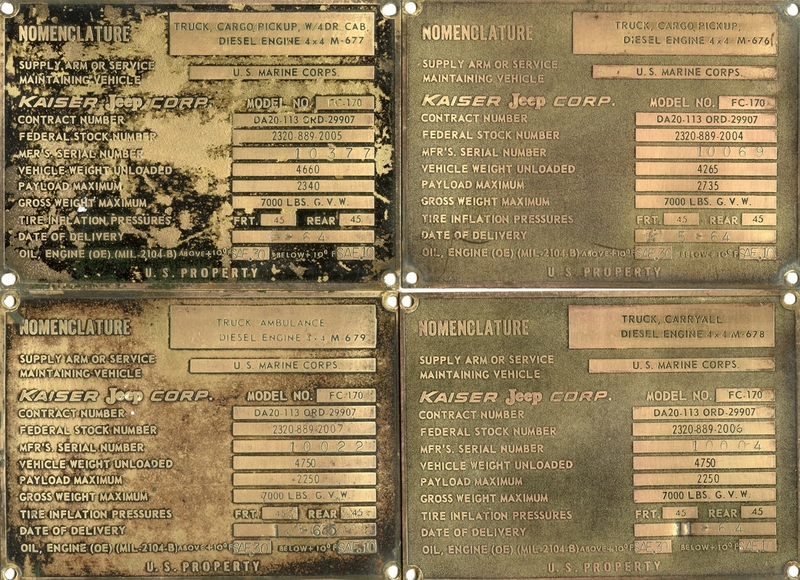 Many thanks to Dan for sharing the pictures of these plates to the FC Connection and for his meticulous description of each part so all Forward Control Jeep owners can have the exact reproduction plates for their vehicles in the near future.